Perhaps the most visited property in Tempe is the former home of Arizona's eighth governor Dr. Benjamin Baker Moeur. Since his arrival in Tempe,the physician's contributions to the community grew substantially and quickly. He began as a physician known for braving treacherous conditions to make a house-call. He served on the Territorial Normal School board and supported the school throughout his lifetime. Being Arizona's Depression-era governor was also no small feat. Although the state was not hit particularly hard by the stock market crash, Moeur worked to secure government funds in order to help any city that was struggling. The first owner of this lot, James Francis Johnson, was a member of a large Mormon colony that settled Tempe in the city's early years. The building started as a small wooden frame in 1893, but has since been expanded by its next few owners, with the most significant contributions coming from Dr. Moeur himself. He acquired the property in 1889 after renting it from a friend for $800 in the years prior. Around 1901, the property would begin to look like a more extravagant house in the Neo-Colonial Revival style. As time passed and additions were made, the house began to take on the Western Colonial Box style seen today. Mrs. Moeur was in charge of the interior of the house, filling it with plush rugs and cozy furniture. After his death in 1937, the property fell into the hands of relatives and private owners. 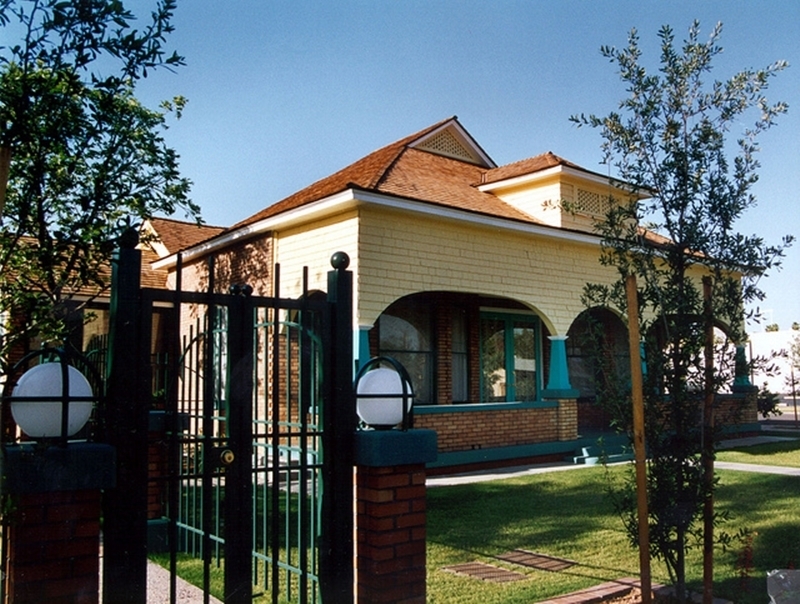 By 1993, the house was taken over and adapted into office space by the City of Tempe. It is now the home of the Tempe Community Council. 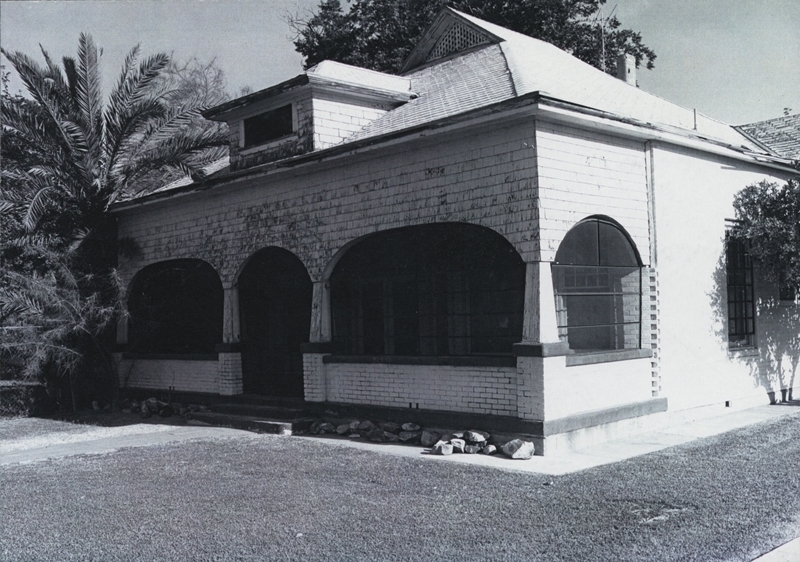 Moeur House, date unknown: This photograph depicts a more run-down view of the Moeur House. However, with a change of ownership to the city and preservation efforts, the house has been restored to look as good as new. Photo courtesy of Tempe History Museum. ~ Source: Moeur House on the Northwest Corner of 7th Street and Myrtle Avenue. Photograph, Unknown. 1999.29.540. Tempe History Museum. 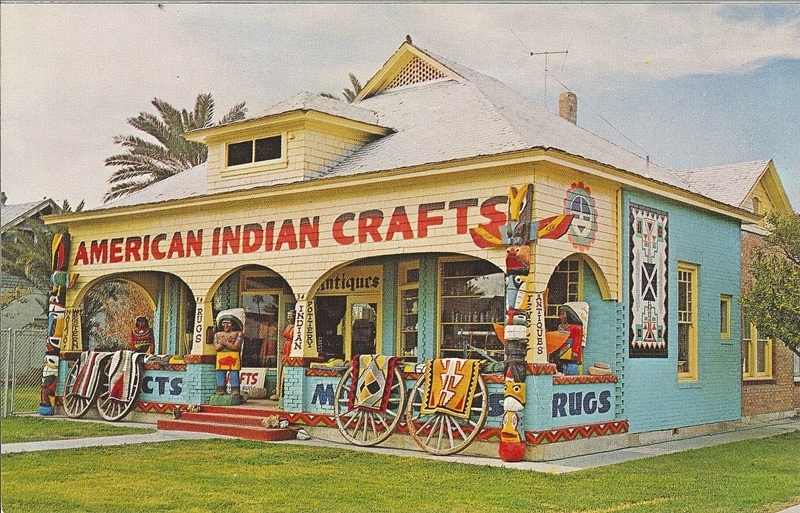 Postcard of Byron Hunter's Curio Store: In 1962, Byron Hunter acquired the Moeur house and operated a curio store until 1983. Just like Garfield Goodwin, Hunter capitalized on the tourist-driven image of the Southwest--an image that melded Mexican and Native American crafts, colors, architecture, and symbols. Photo courtesy of Joe Nucci. ~ Source: B.B. Moeur Curio Store. Postcard, c. -1983 1962. Joe Nucci Personal Collection. Intersection of 7th Street and Myrtle, Downtown Tempe. 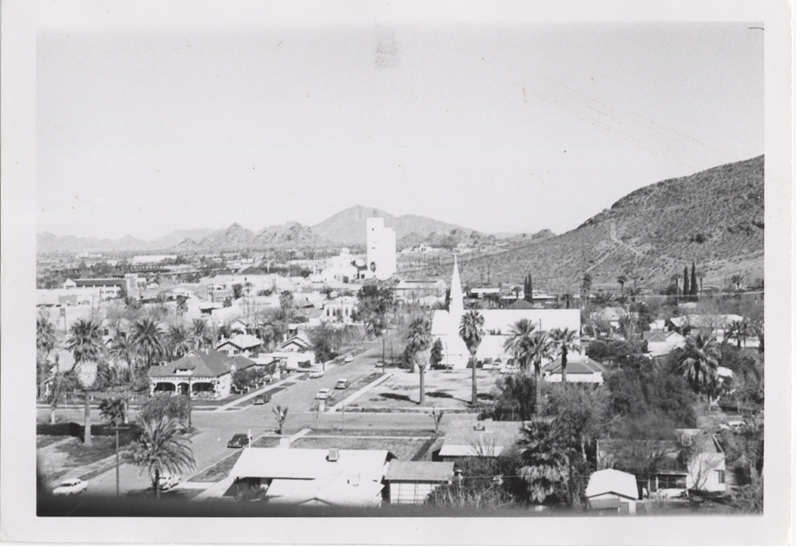 : This photograph taken in the 1960s depicts Mill Avenue and the surrounding area as a downtown sprawl surrounded by desert. At the time of this photo, the Moeur House was a curio shop. Courtesy of Tempe History Museum. ~ Source: Photograph, Intersection of 7th Street and Myrtle, Downtown Tempe. Photograph, 1960s. 2004.19.39. Tempe History Museum. Holly Solis, “Governor B. B. Moeur House,” Salt River Stories, accessed April 20, 2019, https://saltriverstories.org/items/show/52. Gart, Jason H., and Archaeological Research Services, Inc. Historical Context Stufy of Sixth Street to Seventh Street, Mill Avenue to Myrtle Avenue, Block 10, Tempe (west), Maricopa County, Arizona. Mesa, Ariz. History International, 2000. Unknown. “Governor Benjamin B. Moeur House.” City Government. City of Tempe, Az. Accessed February 6, 2014. http://www.tempe.gov/index.aspx?page=2226.